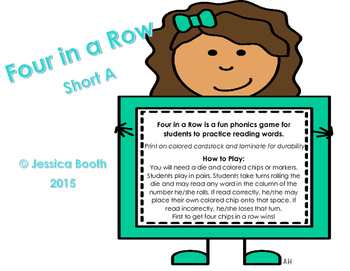 Four in a Row is a fun phonics game for students to practice reading words. All of these words practice the short a sound. You will need a die and colored chips or markers. Students play in pairs. Students take turns rolling the die and may read any word in the column of the number he/she rolls. If read correctly, he/she may place their own colored chip onto that space. If read incorrectly, he/she loses that turn. First to get four chips in a row wins! 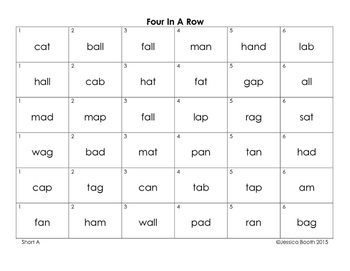 For Four in a Row games for all short vowels, see https://www.teacherspayteachers.com/Product/Four-in-a-Row-Short-Vowels-2245413.